Though not as fabulous in abundance as last week's Great Monday Give, this week's is a must-have for every kids' library. Sooooo, without further blah blah blah, one lucky reader will win a like-new Scholastic paperback of The Story About Ping. All you have to do is comment on this post before Sunday ~ November ~ at midnight CT. The next day, the winner will be announced. And now... by the highly technical, blind scroll and point method, the winner of last week's give, that awesome collection of Ms. Potter, is... drum roll... longtime reader and vintage kids' book advocate... Jonathan's Mom. (I can't remember if she's ever won before, but if she did it was a while ago, so there.) Congrats. Of further note, I am running a holiday shipping sale at my Etsy shop. I am offering a flat shipping rate in the Continental US of $3... buy one book, it is $3 to ship. Buy 10 books, it is $3 to ship. Buy all the books on the site... it is $3 to ship. You get the point right? Of even further note, beginning next Monday, I will try and feature a holiday book every day until Christmas. I might step off the theme if I find something super cool, but for the most part I'll be highlighting holiday faves and forgottens. Of even farther out further note, if you get a chance, check out my guest post on the Savvy Source today. Ooooh, I'm so excited! I've never won anything here before. I hit the jackpot. :) Thank you so much! oh good... i was afraid you'd been around for so long that i'd picked you before... yea! e-mail me your info and i'll hook you up. webe(at)gvtc(dot)com. Could they have possibly read this book on Reading Rainbow? I think I remember it from there but I could be confused . . . Regardless, would be a great book for the collection! Ping is awesome, sign me up! a marvelous classic. and one I don't have. alas, that always seems to be the case. my word verification was shamoo. ha! Hi I just found your site via dooce and it is lovely. Don't know if you've seen this (I see now it is quite old!) 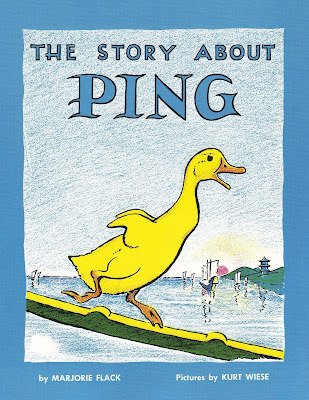 but my computer scientist husband recently showed me this amusing review of 'The Story of Ping'. For more fun look here (scroll down a bit if you're not into the technical stuff! ).